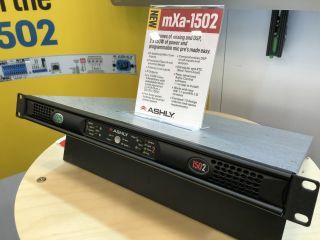 Ashly Audio is using its appearance at ISE 2019 (Booth 3-C104) to introduce the mXa-1502 Mixer Amp, the first solution in the company’s next generation of pro AV products. The mXa-1502 Mixer Amp is an integrated product that combines four zones of mixing and DSP, plus 2 x 150W of power and programmable mic preamps, in a single rack-mountable unit. Ashly Audio says features of the mXa-1502 can help integrators win more clients among the small- and medium-sized business sectors of retail, hospitality, and house of worship. Integrators can deliver long-term assistance via the mixer amp’s built-in web server, which offers a web-based control platform. If an end user requires assistance, an integrator can first log in to the controls remotely before rolling a truck out to the site. Further, the company says the control system is built in an intuitive way that ensures it can be used effectively without extensive training, with different levels of control for users and integrators.